Written collaboratively by Amanda Blair, Holly Swee, and Adam Rhody. As grilling season is getting into full swing many grillers are in search of the perfect steak. With so many different options out there it’s good to have plan before you head out to shop. Type of steak is a personal choice so if you know your preferences for flavor, tenderness or marbling that’s a good place to start. If you’re unsure we’ve put together a quick guide for finding the perfect steak to try. A general rule of thumb is the more expensive the steak is the more tender it should be. But finding a great steak really depends on what you like. If your top priority is tenderness, a Tenderloin – also known as a Filet or Filet Mignon – is a great option. If you’re after an extremely flavorful cut a Sirloin should be on your list. Ribeyes and Strip Steaks have great beef flavor and are also tender. One reason that Ribeyes and New York Strips are so flavorful is the amount of marbling. Marbling is the small flecks of fat within the meat. The amount of marbling determines the grade. The USDA beef grades you will typically find in grocery stores or at restaurants are Select, Choice, and Prime and these are also related to price. Select cuts will have the least amount of marbling and Prime will have the most and typically be the most expensive. Other popular beef items for summer grilling are fajitas and kabobs. Grocery stores will sell these items, but you can save a little money by cutting them yourself. A sirloin works great for kabobs since it is a tender, lean cut. For fajitas, try a beef skirt steak or flank steak that you can grill whole and slice thinly across the grain. Speaking of price, the beef industry has developed several new value cuts over the past few years including the Flat Iron, Denver Cut, and Chuck Eye Steak. These cuts have great flavor and tenderness and generally sold at retail for less than more traditional steaks such as the ribeye. However, since they’re new to the market they may not always be available at retail so if you can’t find them ask your butcher or grocer, they are worth a try. The Flat Iron in particular is gaining popularity because it is very tender and flavorful, but they’re sold in the meat case cut a couple different ways. One cutting method results in an oval shape with a long section of connective tissue down the middle, which can lead to tenderness issues. The more preferred cutting method results in a rectangular shaped flat iron. Beef is a great option to add to your diet because it contributes important nutrients such as protein, iron and zinc. There are also plenty of lean beef options that can be incorporated into a balanced diet. In fact, there are over 37 cuts that meet the government guidelines for lean. 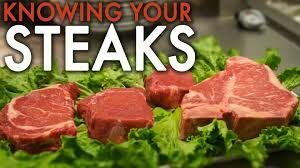 Many popular cuts in the meat case qualify as lean such as Flank Steak, Tenderloin, T-Bone steak and 95% lean ground beef. A good rule of thumb is to look for the word loin or round in the name and that usually indicates a lean cut. The American Heart Association has also named 9 fresh lean cuts of beef that meet the Heart Check-mark certification.